We did promise that we’d get off the subject of food, so apologies for the cake element in this post! 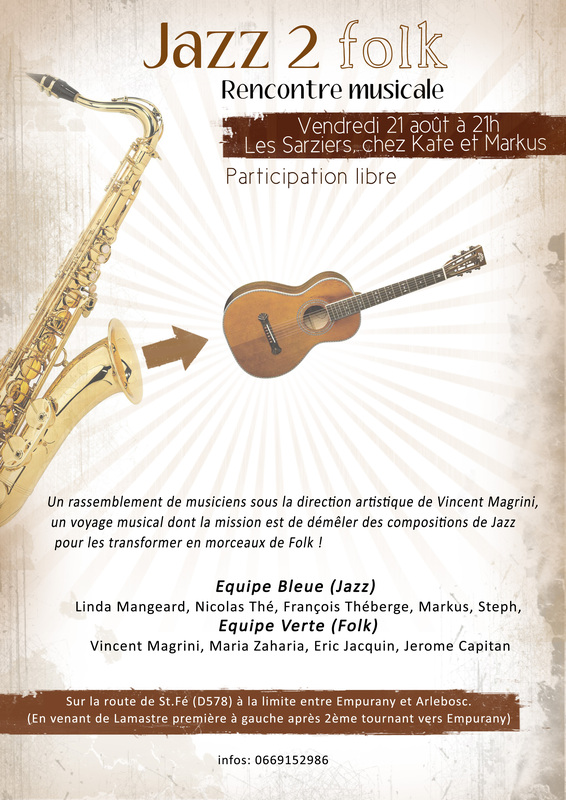 This is going to be a great evening, with François and Linda Gallix and Markus playing a relaxed selection of numbers from the 20’s to the 50’s. 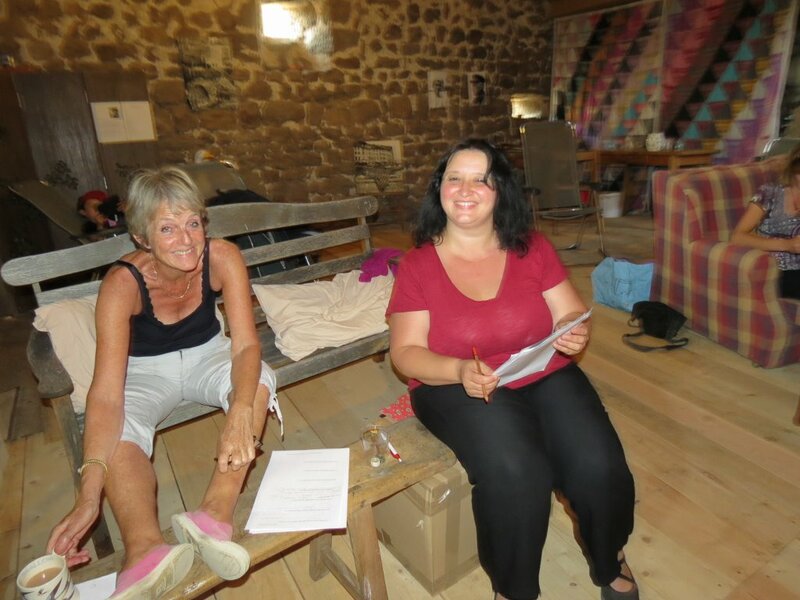 The concert will be in the barn and after the music people are invited to stay on and sample a selection of typically English cakes in the kitchen. There should be something to please everyone! 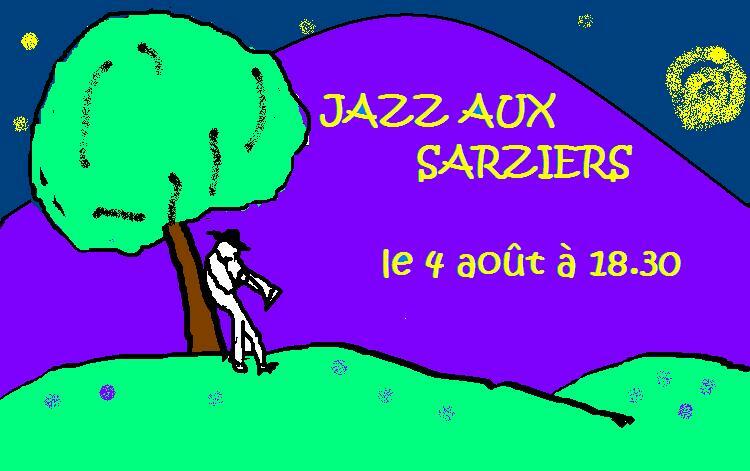 Our next big day is on August 21st when we are getting a group of them together at Les Sarziers for a workshop followed by a concert called Jazz2Folk. 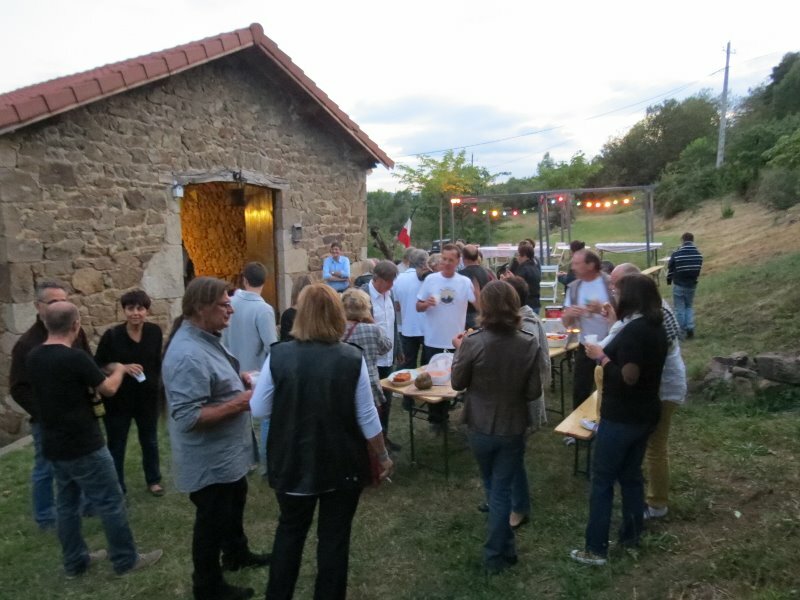 We rounded off the day with a party and jam session (called a boeuf in French for some unknown reason) at the Gallix farm. About seven years ago François stepped back from an international career and non stop touring to settle with his family at the farm which had once belonged to his grandfather and is now worked by his brother Thomas. Thomas produces honey, chestnuts and scrumptious fruit juice and François is mainly involved in the forestry side of the enterprise though he helps out when there’s a lot on. Together with their enthusiastic WWOOFers, they had just picked 30 tons of the little Ardéchois pears which grow semi wild round here and taken them to be juiced, before attacking the apples. Their grandfather had planted several old species which are now hard to find, along with the more traditional reinettes (russets) and canadas. 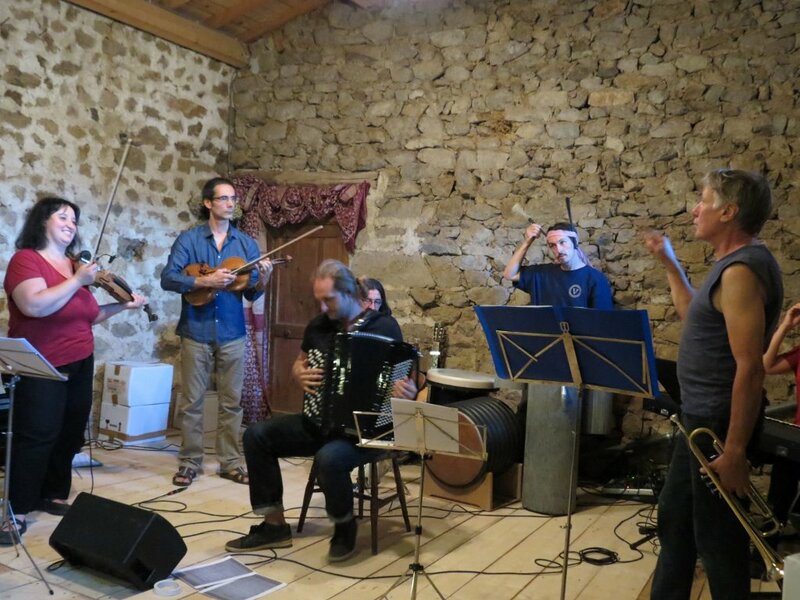 François is in contact with a huge network of world class musicians who are happy to come and play at the gigs he organises in various locations throughout the year and especially through the summer. 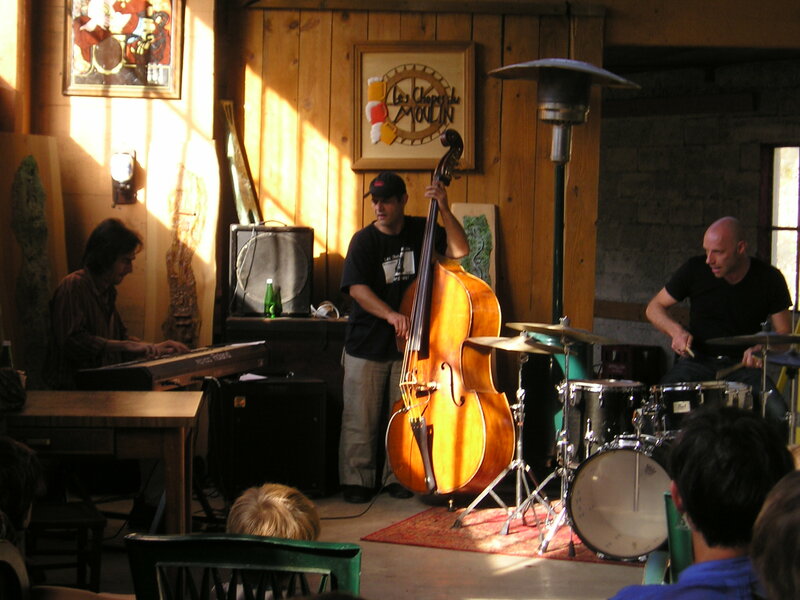 For some years the most popular summer fixture has been the Mardis Jazzy in the Lamastre microbrewery “Les Chopes du Moulin” and we are all sorry that Joann, who owns the brewery, is selling up and moving to Quebec. 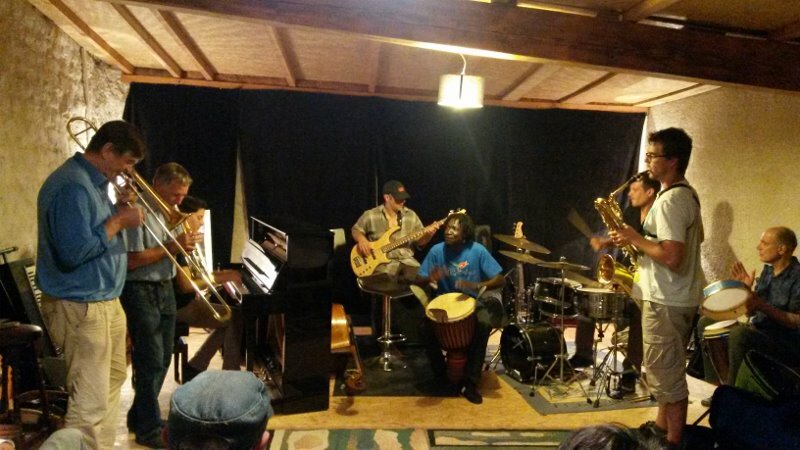 So the party was a wrap up of the season and to mark the end of Jazz at Les Chopes. Who knows what next summer will bring, but our area is full of initiative and surprises and something new always seems to be just around the corner. If one door is closing no doubt another will open. 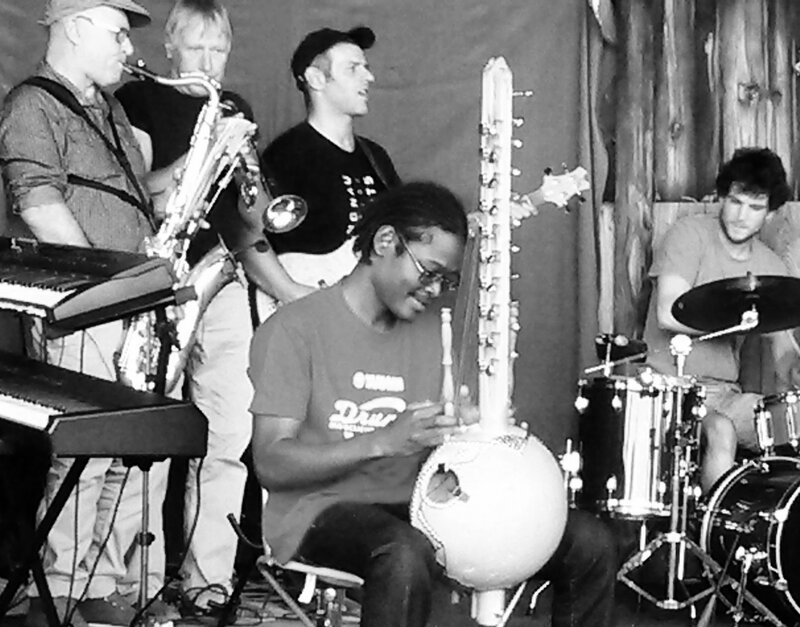 Markus has been playing regularly at the Jazzy Tuesdays and also rehearsing every week with François’s wife Linda on piano and his friend Hans on trombone. 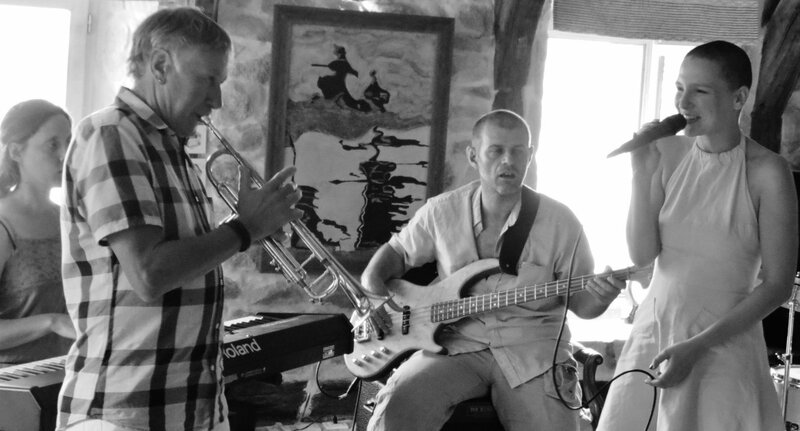 A few weeks ago François’s trio was booked for a private party given by our neighbours in Arlebosc and Markus and Hans played nearly the whole gig with them. 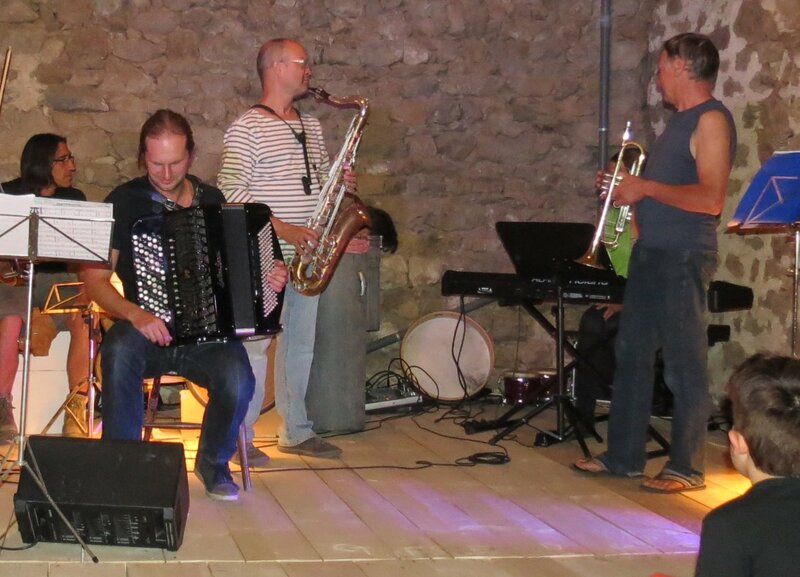 It was a great evening and something of a revelation for the Arlebossiens who had been invited and had not known that Markus plays the trumpet. So along with his talents as photographer it looks like he may be requisitioned for any village event which might require a brass instrument. The angel Gabriel for the Annunciation perhaps . . . . ? STOP PRESS Last night, already on the way to a concert at Marie Café, where Linda was playing as a duo with Pierre Lafrenaye on trumpet, Markus got a call from her to say that Pierre’s car had given up the ghost, he was stranded in the middle of nowhere and could Markus do the gig with her. It was by all accounts a triumphant success. I am just so sorry that I could not be there! 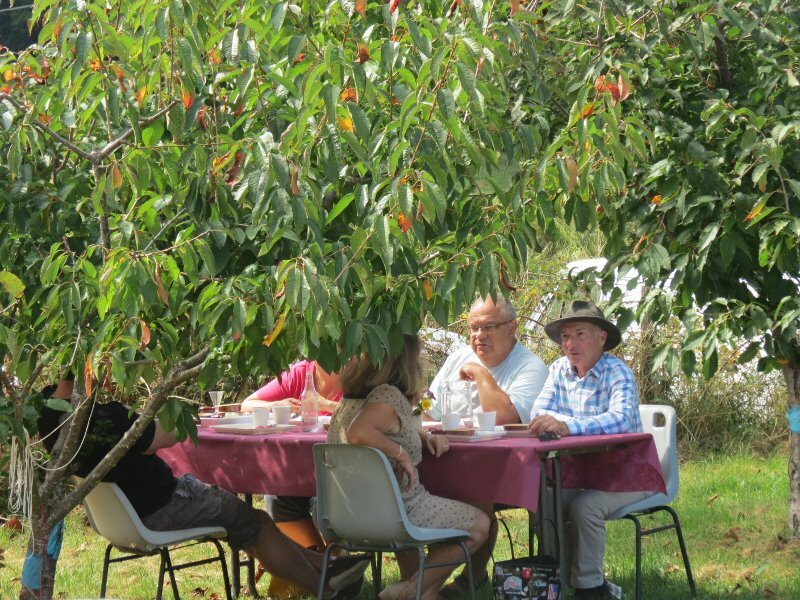 So we said goodbye to our hosts and to the last guests, who were lingering over their coffee in the shade of a cherry tree and set off for Alboussière where an annual event, repeated in all the towns and villages at this season, was in progress. La Rentrée, rather than New Year is the is the national moment for good resolutions, when the whole of France is back from its holidays and returning to school or work. This is the time to decide that you will really get to grips with learning English, take up the piano or Tai Chi, join the basket ball team or a woodworking class. Consequently each locality holds an open day one Saturday in early September where all the different clubs, associations and good causes set up an information stand and encourage inscriptions. 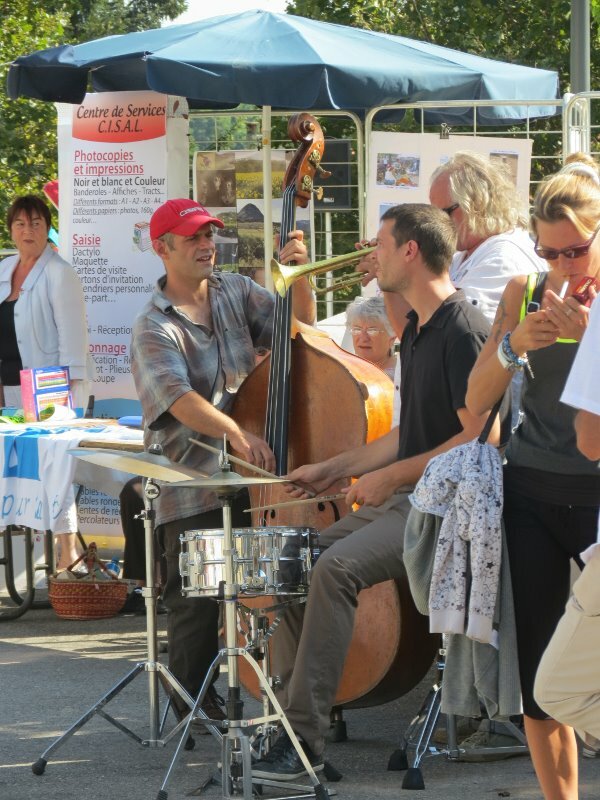 François and his trio were to provide music for part of the afternoon, but before they started they had an important call to make. 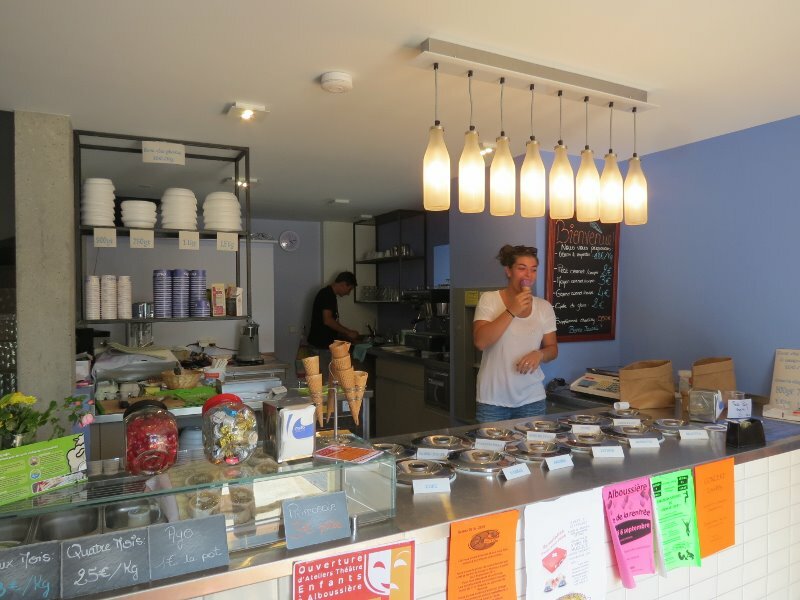 We found the three of them fortifying themselves with gelato and espresso at Cuto. The place is tiny and unpreposessing from outside but as soon as we stepped into the cool interior we knew that we were back in Italy: gelato to die for and proper coffee! What’s more they sell wonderful peccorino cheese, sheeps’ milk yoghurt and the best ricotta this side of Umbria. 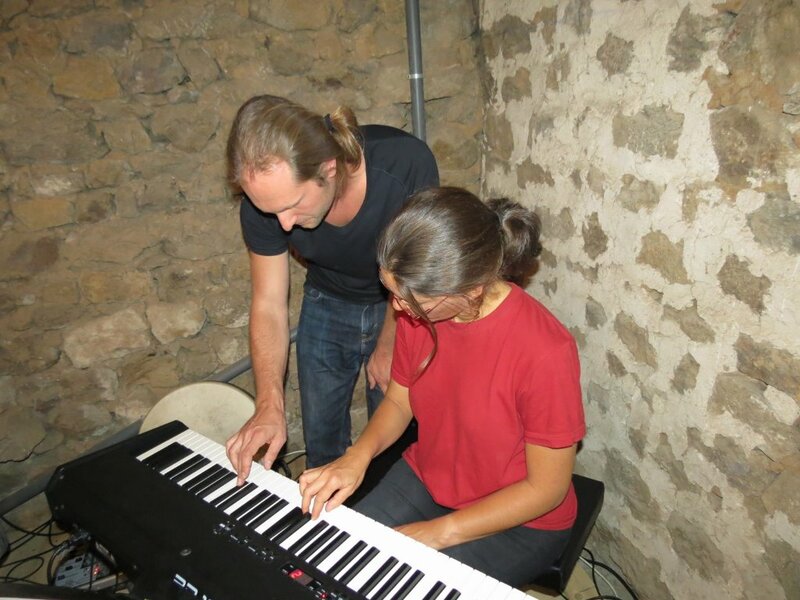 Cuto is just one part of an ambitious project being undertaken by an incredibly dynamic young woman who arrived in the Ardèche four years ago from her native Assisi. She bought a ruined farm, which she is renovating with a view to creating a venue for a wide range of cultural events and exchanges. Music is obviously going to be part of the story and she has been in discussions with Paolo Fressu and Carla Bley, two of our all time musical heroes. 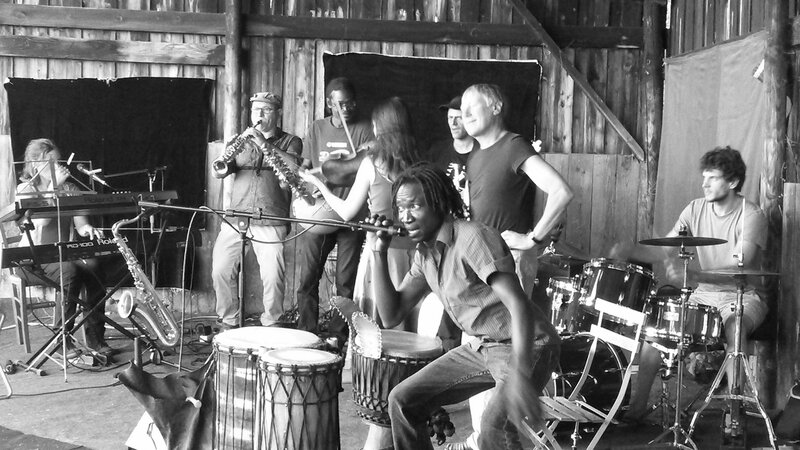 François says “pourquoi pas?” and indeed, given the vibrant music scene around here, why not? The building work is dragging, but Roberta has no time to waste and all through October she will be hosting an event for illustrators and photographers with an exhibition, workshops and master classses. Definitely one to watch! We had a bit of time to kill before our next jazz engagement so we went to look for Roberta’s farm. It is tucked away in the hills down an endless winding track through a scrubby landscape which could indeed be Umbria. We passed the sheep which provide milk for the cheese and yoghurt, doing their bit to keep the rough grass down, and and encountered a few of her Pastori degli Abruzzi – those vast and deceptively cuddly looking Italian sheepdogs which guard their flocks against wolf or human attack with equally instinctive ferocity. Roberta breeds them and also rears Cardigan Welsh Corgis although we saw no sign of them. There’s still a lot of work to do on the farm buildings, but with energy like hers we are sure that she will be ready for the October festival. 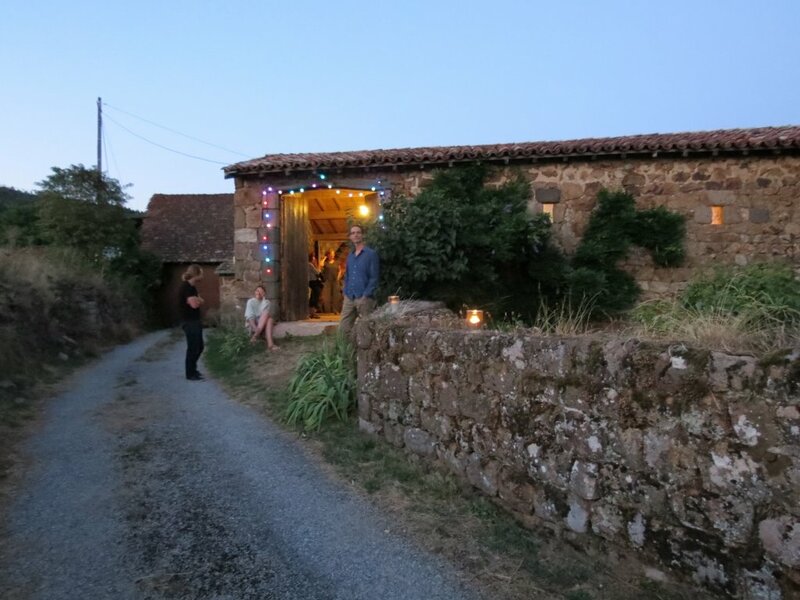 Then it was time to head off to François’s farm for a party to celebrate the completion of his new music room . . . .
We never did get round to visiting the snail farm at the Col des Fans. It is a bit out of our normal range, being on the road between Lamastre and Valence which we no longer use so much now that the TGV station has been relocated outside the town of Valence. Also, although I don’t mind eating snails from time to time, neither of us was too sure how keen we were to learn the details of raising gastropods and the procedures involved in turning them in to edible delicacies. 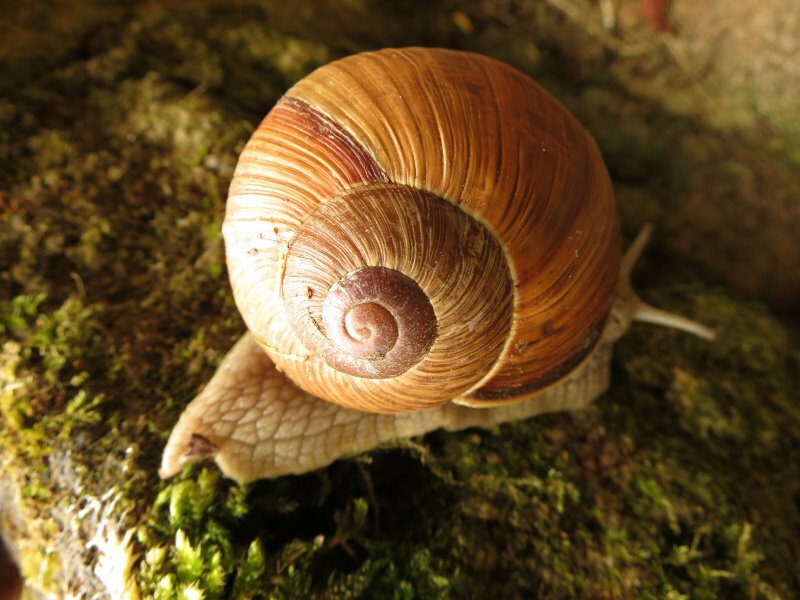 I have vivid childhood memories of one of those wire salad shakers full of live snails left hanging for a day or two on the window handle in a French kitchen so that they could fast and purify their systems before being sent to the pot, and it was not a pretty sight! However friends had told us that the current owners are retiring and, having failed to find a purchaser for their farm, were organising a closing down event: an al fresco snail lunch to eat up the stock! 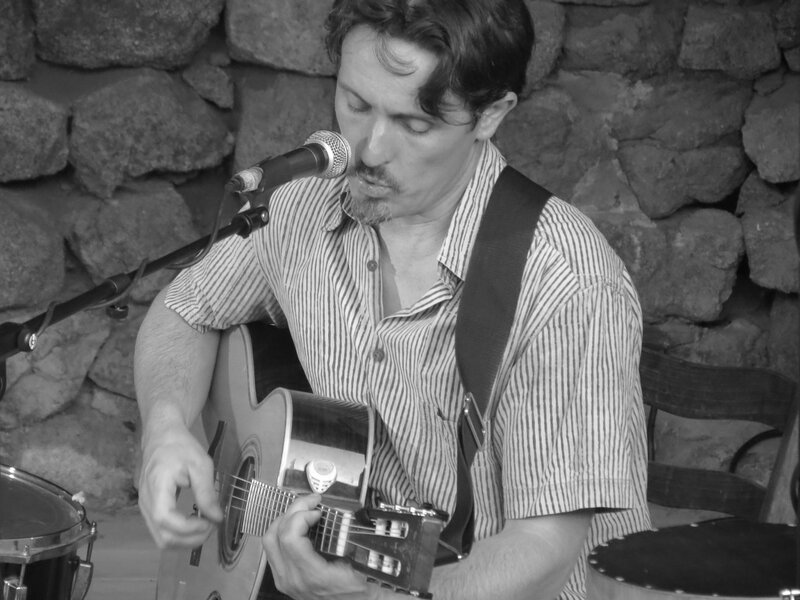 François Gallix would be playing, there was to be a brocante and a Batucada, our friends were going, so we booked a table. It turned out to be the most delightful event. The farmhouse itself is very old, with a magnificent carved stone mantle over the immense kitchen fireplace. It is just over the pass, in a bend of the old road and enjoys splendid views. We were somewhat relieved to note that the concrete snail pens (if that is the correct word) are now all empty, the overhead sprinklers have been switched off for good and the former inhabitants left some time ago. There were obviously to be no distressing scenes. The tables had been set out on a rough grassy area above the kitchen garden and decorated with flowers. 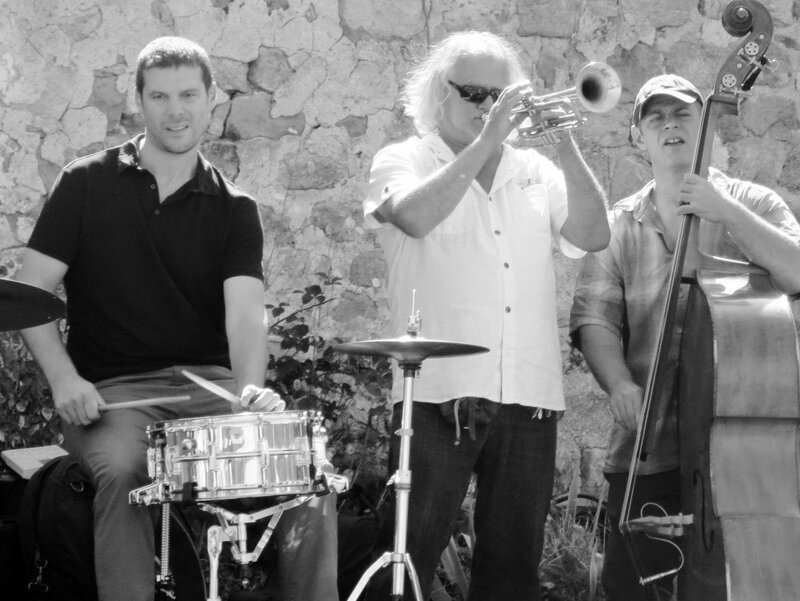 It was a glorious sunny day and we strolled about and explored before settling down with an apéritif to listen to François and his trio. The owners, Hélène and Thierry were charming hosts and had produced a unique and delicious hélicicole feast. With the castagnou apéritif we were offered canapés of a sort of snail tapenade, followed by a tiny cup of warm nettle soup with snail pieces and crème fraîche. Pitchers of white and red wine were brought round together with a brochette of barbecued snails and then an individual casserole of snails cooked in red wine and onions on a bed of rice. Dessert was a rather more conventional choice of chocolate mousse or chestnut soufflé and the Batucada serenaded us table by table as we ate it. I was reminded of the classic shaggy dog story of nocturnal snail hunters equipped with drums, torches and watering cans to trick their prey into believing there was a thunderstorm in progress! 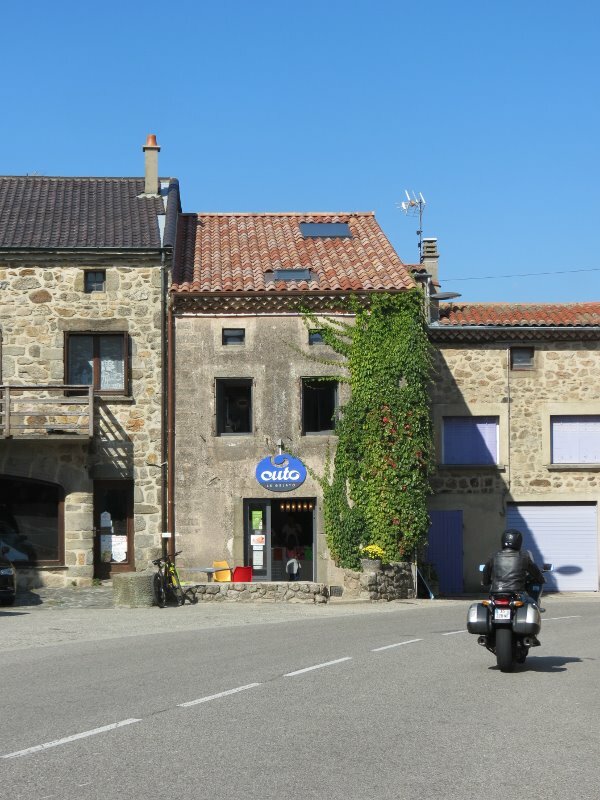 Coffee was on offer but François had given us an intriguing address in the neighbouring village of Alboussière, where he was off to play next. 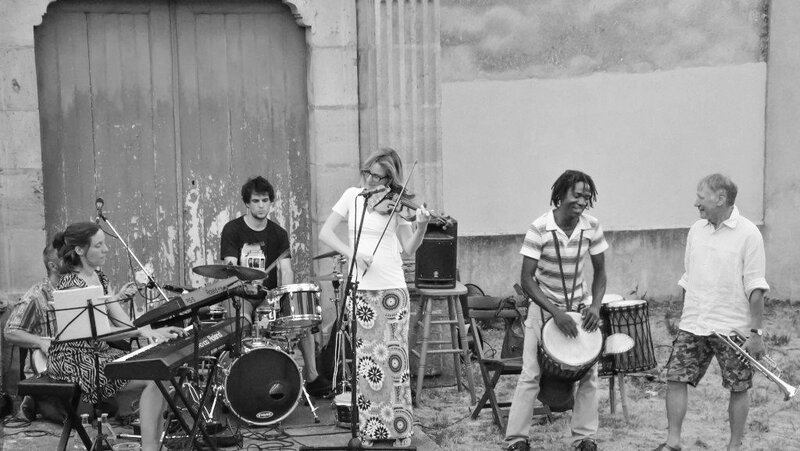 The small towns of Tournon, Lamastre, Desaignes and St.Agrève have in recent years grown into thriving venues for music festivals and ad hoc musical events during the summer. As Les Sarziers is only a short driving distance from these places, we are spoilt for choice. Probably the most original performance space is the ex-flour mill of Lamastre, now turned into the micro-brewery “Les Chopes du Moulin”. 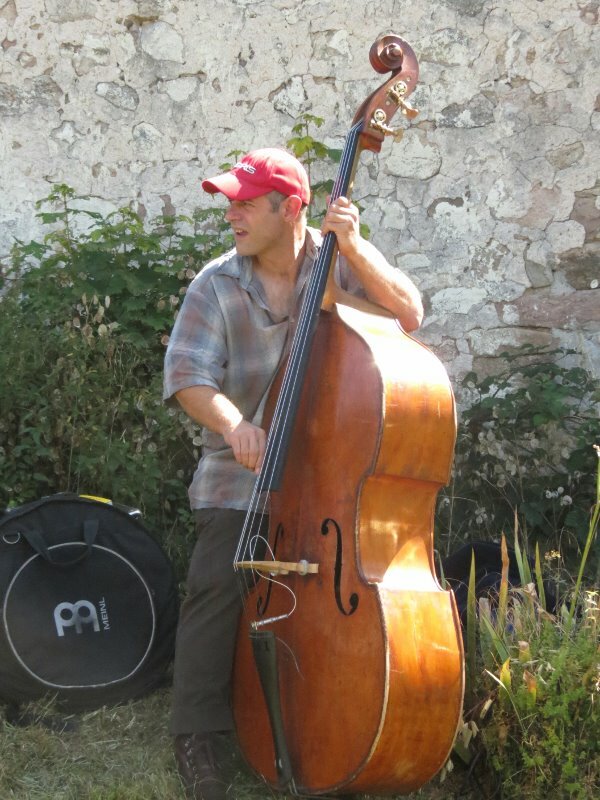 Every Tuesday the bassist François Gallix invites other professional jazz musicians to perform there. For a “provincial” concert the quality is incredibly high and appreciated by a big crowd of regulars and holiday makers. 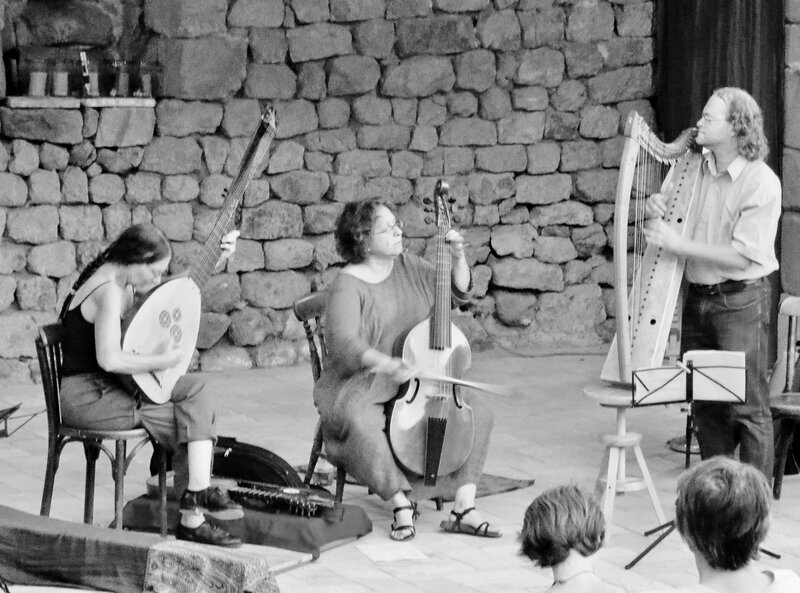 Unfortunately today is the last concert of the season … vive l’été 2011!